Registration to Webmedia 2014 must be performed through the SBC ECOS system. You must have an ECOS user account to perform the registration. If you do not have an ECOS account yet, please create one at the provided link. * On the event, registrations will be accepted only in cash. Registrations for Webmedia 2014 are performed for the entire Conference, with no possibility to register for specific groups of symposia. Attend Keynotes of the symposium. Opening Cocktail of Webmedia 2014. The standard registration for the Conference does not include any short course of Webmedia. For each desired short course, an individual fee should be paid separately. Beware of not registering to any short courses and/or workshops that take place in parallel. For each accepted paper/work in a Webmedia 2014 symposium or associated event, at least one registration for the conference from one of its authors is expected. The registrations for authors with accepted papers/works at the conference should be performed by the first discounted deadline: “EARLY (until 20-october)”. Payments can be performed through: Credit Card (on-line) [Visa/MasterCard], and other three local forms (for Brazilian residents). SBC members should have the 2014 annuity paid to be eligible for discounted values. Registrations performed after 17-11-2014 may only be paid in the Conference Secretary at the venue. 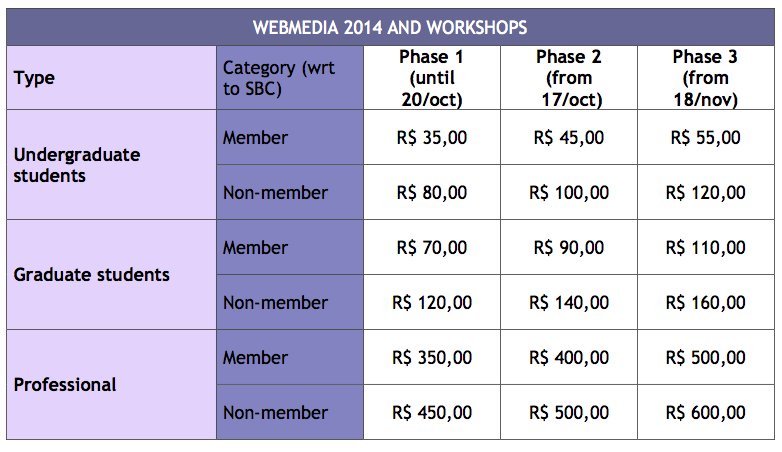 SBC members have special discount on registration for the Webmedia 2014, plus many other benefits such as: discount on registration for more than forty other events promoted annually by SBC, discount for purchase of SBC publications and books of the Campus/Elsevier publisher, access to the mailing lists maintained by the society, receiving the Computer Brazil magazine, and unrestricted access to the Digital Library and to the electronic journals maintained by SBC, among many others. If you are still not SBC member, join now by clicking here.